Stuff Gravity: The more I own, the more it owns me. I found that accumulating a messy buildup of possessions weighs a person down mentally, emotionally, and spiritually. It all becomes such a burden, taking care of stuff, worrying about losing it, getting it stolen, or watching it get ruined. The more you own, the more you have to clean, store, and move. Since leaving home for college, I can recall 23 major moves. You’d think I would have caught on a little sooner to the gravity thing, but it’s only been in the last 3-4 years that I have finally begun to learn the secret joy of de-stuffing. Though I was initially resistant, I thought about his words over the next few days. I thought about all the energy and effort it had taken to move that stuff around so many times—stuff we weren’t even using. I thought about how bogged down I felt, knowing my basement was so full. My husband was right. It was a total lie that I had let this stuff become so important to me—stuff I didn’t even use. When we moved out of our house that summer, we had three garage sales and made about $2,500 on STUFF. And even after all that, we hauled away a whole big trailer full of fairly nice stuff and left it outside a local donation spot for those in need. By this time, watching my whole basement clear out, I was beginning to feel so great; I was ready to give everything away. Since then, we have moved three more times and, each time, I take the opportunity to ditch more stuff. How in the world does it accumulate? I feel like a giant stuff-magnet! But the more I get rid of, the better I feel about life, and the more I want to get even more simple! So this summer, guess what I’m doing? Going through everything that’s left, and if it is not something I use NOW, it’s going away. And I feel so great about it! Don’t you think God knew how much stuff would weigh us down with cares in this world? Jesus’ admonition was all about trying to help us keep life simple, carefree, and weightless. What about you? Are you ready to clean out those closets with me? Have a big garage sale. Donate the money to orphans or your favorite charity. You’ll feel a lot lighter in spirit while also knowing you did something to make a difference! Truly an awesome feeling! Yeah, right, whatever! How about that garage?? Great reminder, Julie! I remember when I returned from China, I was made aware of how much "stuff" I have gathered. I seem to become too emotionally attached to the "things" when I need to remember that I have the memory, and don't need all the clutter. I really don't want to be like those really sad folks on the TV show "Hoarders". 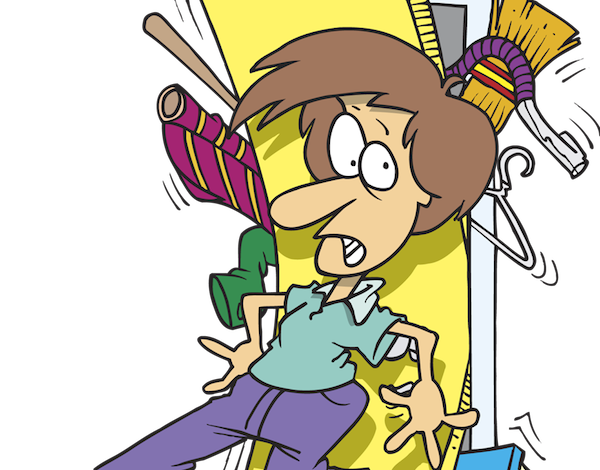 It isn't easy, so I do covet your prayers as I take the De-Clutter Challenge! Hey Roena! So good to hear from you. It is so freeing to cut the strings to stuff, but I agree. It's hard not to get all sentimental, especially about stuff our kids made! I used to be very pleased to search out this web-site.I wanted to thanks for your time for this wonderful read!! I undoubtedly enjoying each little bit of it and I’ve you bookmarked to take a look at new stuff you blog post. Outstanding post, you have pointed out some excellent points , I also conceive this s a very fantastic website. Can I just say what a aid to search out someone who actually knows what theyre talking about on the internet. You definitely know the right way to bring a problem to light and make it important. More individuals need to read this and understand this facet of the story. I cant consider youre no more popular since you definitely have the gift. Thank you so much for writing all of the awesome information! I am looking forward to checking out more posts! Don’t you think you should elaborate a little more? Do you really think it’s that neccessary? I think you should elaborate more info at small business telephone systems. Dude.. I am not very much directly into reading through, but for some reason I obtained to see quite a lot of articles on your own web site. Its impressive how interesting it is for me personally to check out you generally. Really appreciate the wonderful blog, they are definitely scarce to come by these days. Hope you don’t mind me coming back to see what goes on later. Many thanks for unveiling these details. I find it most useful and definately forward it to friends, too. If you carry on writing concerning this I will certainly continue browsing your future content.